Backup strategy is the best prevention Against WannaCry Ransomware virus attack. 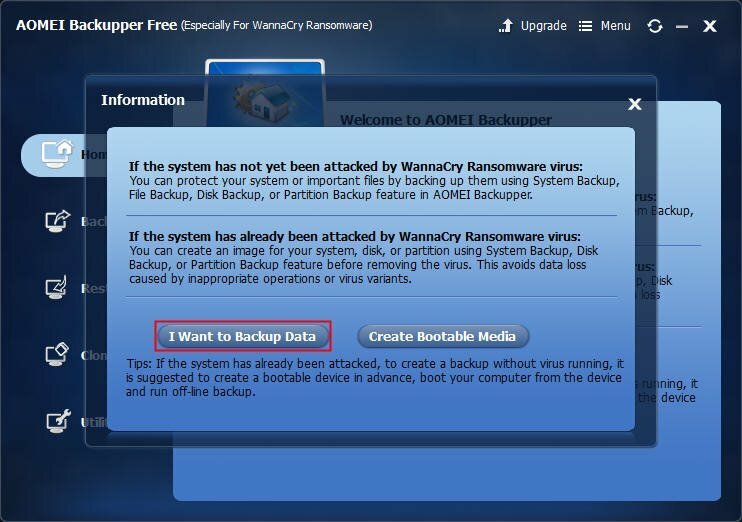 AOMEI Backupper Free for WannaCry Ransomware will give you best two Ransomware Backup solutions. What is Ransomware and how Ransomware spreads? Lockscreen Ransomware: It shows a full screen message to prevent you from accessing your PC or files unless you pay the ransom. Encryption Ransomware: It will encrypt your files that you can’t decrypt. The Ransomware will delete your original files and raise ransom if you delay the payment. Recent Ransomware attack named WannaCry Ransomware is one of the encryption Ransomware. How to prevent Ransomware effectively? You have to know how it spreads, then find the appropriate Ransomware backup solution to block Ransomware. The recent WannaCry Ransowmare virus infects your computer by exploiting the critical vulnerability (called EternalBlue, discovered by NSA) in an older version of the Server Message Block (SMB) network protocol. WannaCry Ransomware virus spreads on the Internet via TCP port, especially between computers on the same network. What TCP port will be exploited by WannaCry Ransomware? The answer is 445 and 139 ports. The two ports are used for file and printer sharing on the Internet. Other dangerous ports include 137 and 138 port. 1. block Windows 445/139 port. The steps of disable 137/138 port are same as the link. 2. Enable automatic updates to install the latest updates. Or install Windows update MS17-010 for Windows Vista, 7, 8.1, 10, Server 2008 (R2), Server 2012 (R2), Server 2016 to protect your computer from the WannaCry Ransomware virus attack. 3. Upgrade to Windows 10. Compared with these solutions, the Ransomware backup strategy could be the ideal way to survive from the WannaCry Ransomware. Now, which backup strategy is the best solution to prevent WannaCry Ransomware? 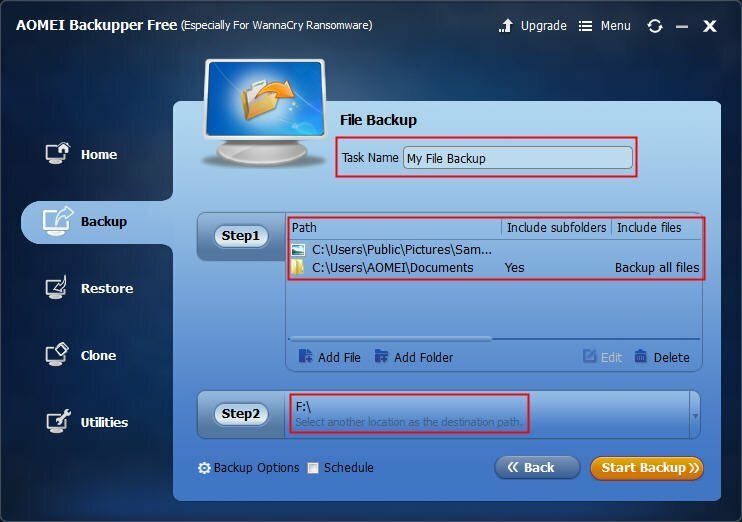 The best free Ransomware backup strategy is using AOMEI Backupper Free for WannaCry Ransomware, which protects your data no matter whether you have infected WannaCry Ransomware virus or not. It applies to Windows Vista, XP, 7, 8, 8.1, 10. Thus, the program offers you two different Ransomware backup strategies to protect your important data. Method 1: Backup data regularly if not infected with Ransomware attack yet. 1. Please download the best defense against Ransomware-AOMEI Backupper Free, install and run it. Make sure you have connected the external hard drive to your PC and it can be detected. 2. Select I Want to Backup Data in home interface. 3. You can choose system backup, file backup, disk backup, and partition backup under Backup column depending on your demands. Here select File Backup. 4. Input a Task Name to distinguish other backups. Choose the files you want to backup in the Step1 and select the external hard drive to save these files in the Step2. 5. Make sure you have ticked Schedule to backup data regularly via daily/weekly/monthly. 6. Press Start Backup to protect your computer from Ransomware. If you are already infected WannaCry Ransomware, the urgent thing is disconnect your computer from the Internet so it does not infect other computers. Then seek help from a technology expert who specializes in data recovery to see what your options might be. If there is none, don’t be upset, you can backup these encrypted files first in case Ransomware delete your essential files. You may get a new advanced security tools to decrypt your files in the future. 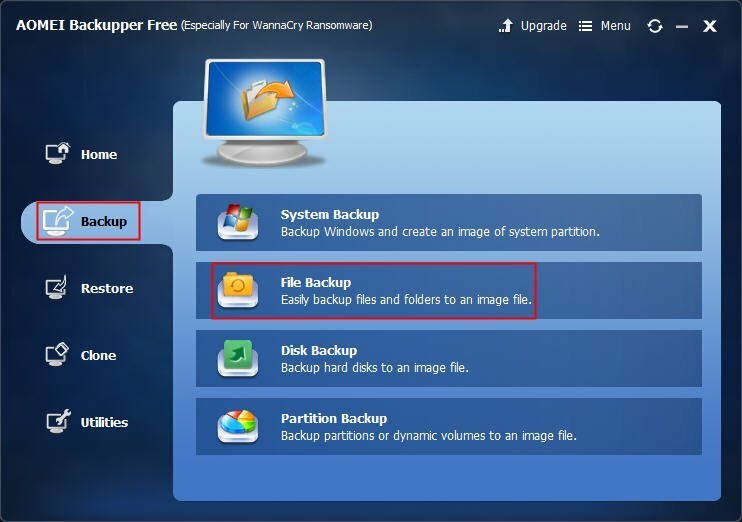 In order to backup your system without WannaCry Ransomware, creating a bootable media is recommended, then backup your system offline. IMPORTANT: The Virus will not encrypt the files in root directory of C drive such as Windows and Program Files folder, so these files will not be lost. 1. 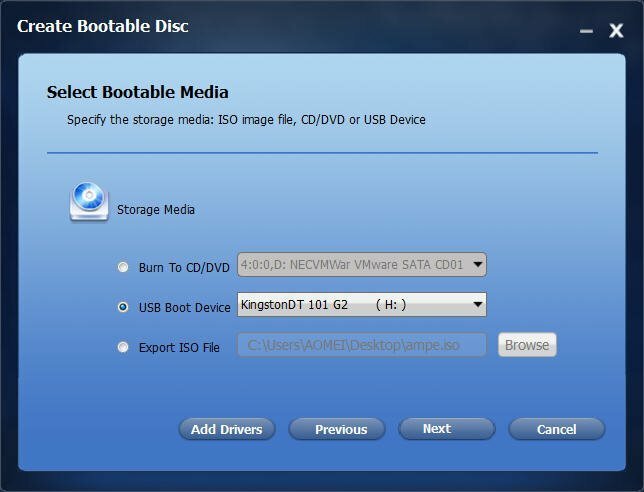 Insert your USB/CD/DVD to computer, then select Create Bootable Media on AOMEI Backupper Free home window. 2. 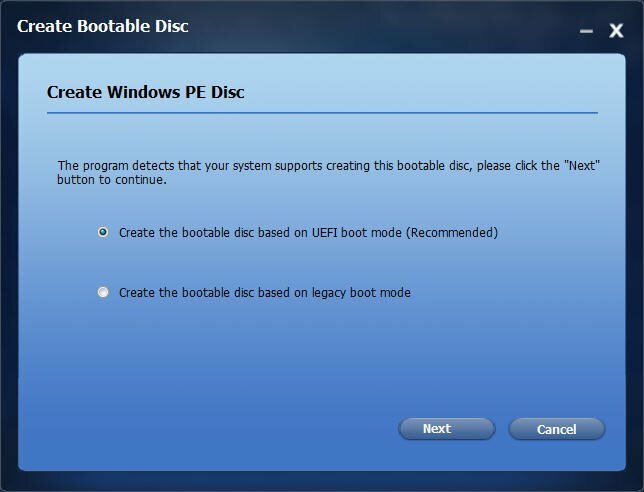 Select to create Windows PE Disc based on UEFI/Legacy boot mode. 3. Choose an option to create bootable media. 4. 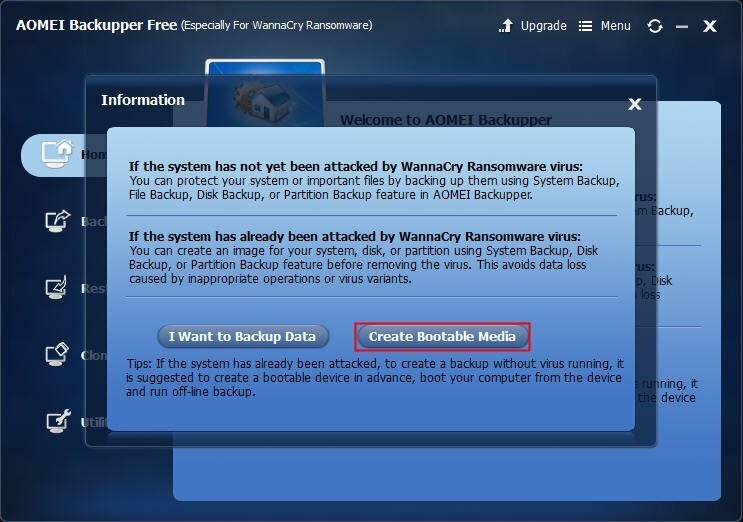 Then boot your computer from the bootable USB drive, run AOMEI Backupper Free, choose a Ransomware backup strategy like system backup, file backup, disk backup and partition backup against Ransomware virus attack. After these two Ransomware Backup strategies, you can protect your data from Ransomware attack. You can also refer to these steps in case you encounter other Ransowmare viruses to protect your computer against Ransomware. With this software, you can recover your files in the future.